My goal was to further use the Müller-Brockman grid that I derived from a 1963 LOOK magazine, achieving a vintage look and feel from a modern setting, while giving selected shots from the event a context. LEFT: Candace Whaley (wardrobe stylist) adjusts a design on Becca Morris (model). ABOVE: Michelle Rivera (makeup artist) touches up lipstick for Becca Morris (model). RIGHT: Michelle Rivera (makeup artist) finishes applying touchups for Sally Wong (model). After looking at the work of hairstylist Bethany Bell, I thought the biggest challenge would be capturing the sculptural aspect of Bethany’s work. The weave and flow of the hair captures the light in particular ways and demonstrates interesting textures and forms. Models move—and different angles and sculptural aspects of the hairstyle are exposed as they move. This is part of the experience of seeing a hairstyle, its interplay with the model and the environment. Certainly, Bethany considers the hairstyle from all angles and designs her work so that it can be viewed—and reveals itself in stages—from any direction. Wanting to bring this experience into the photographs, I exploited a mirror that would show off the hair from two angles at once. The final lighting, through careful technique, appears as though it is mid-day, soft window light. This natural look accentuates the curves, soft shadows, and intricate weaving. I think Bethany’s work looks great in this light—I hope you do, too. 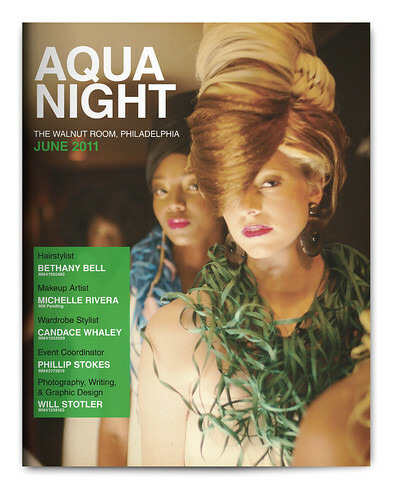 I was invited to Aqua Night, an event that focused on fantasy, fashion hairstyles. The event was hosted at the Walnut Room, a lounge/club in Philadelphia. I figured it would be fairly dark, so I decided to shoot with my CV 35mm f/1.2 lens—bringing my SF-24D flash (and sync cord) along, just in case it would be needed. I arrived at the event start time—meaning two-and-a-half hours early—and took time to inventory possible shooting scenarios: Places to shoot and also lighting conditions. Ambient light was poor, averaging an EV of 2 or 3 at ISO 320. Pre-event, the models staged in a side alcove downstairs—I shot a bit of this area and the models getting touchups and wardrobe adjustments. I also dug out the flash—even f/1.2 wasn’t enough to overcome the lack of light. The event itself, including a fast runway walk to show off the styles, happened in the main Walnut Room lounge. I elected to not shoot the runway work because I didn’t like the clutter in the frame—any shots I took wouldn’t convincingly look like runway. I shot for about 25 minutes. Light was put into the scene by a hand-held, off-camera flash, which I bounced off of the bank of windows, camera left. Intensity and direction of light was controlled by pivoting the flash in my hand, shooting a test, and then refining angle. TTL mode was used to balance the scene’s light. The models were patient throughout the process—I had about 120 seconds, give or take, with each model and pair of models. This set was really screaming at me for context—so I decided to select a few key photos to get at the concept of the shooting and then make this spread. 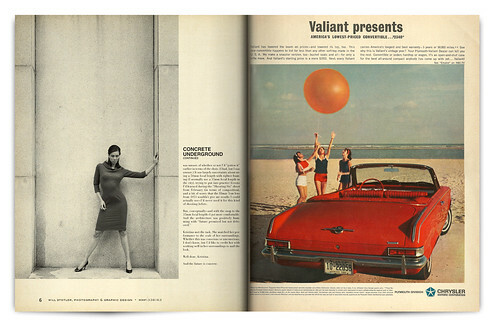 Layout of this spread was completed via InDesign, using a custom-made Müller-Brockmann grid, which I had designed to be based on LOOK magazine dimensions, content ratios, and typography. It was a carry-over from my previous LOOK magazine project work—I’m not yet done with this kind of grid and look. One more chance to learn. I built the vintage page background from a few different scans, creating (via Photoshop) an unbroken surface that could be used in the page spreads. The shadowing and lighting effects for the pages—which give the optical illusion of page solidity and depth—were developed on a previous project and further adapted for use here. Black and white shots were treated using TrueGrain and Tri-X Pan grain, with filters as needed to bump intensity/density of luminosity. Color photos were treated by using a layering effect in InDesign, compositing the color photo over Tri-X Pan treated black-and-white versions of the same photos. This layering of photos—provided the balance of the compositing is correct—emulates the tonality and “color character” of 1960s film stock, as displayed on vintage paper. Last, this project wouldn’t have been possible without the work of everyone who made the event a success—hairstylist, makeup artist, wardrobe stylist, event organizers, all the models, and a general community effort. Well done, worth shooting. Links to PDFs are provided below. These can be opened using the free Adobe Acrobat Reader. NOTE: It is recomended that you “right-click save-as” the files to your computer, then open them there. So, I’ve been wanting to shoot a fashion event for some time—this one came up, so I hopped on it. I wanted to work an event from the back—embedding with models in their environment during prep and while they were waiting to hit the runway. Documentary style. As usual, shooting f/1.2 posed challenges—but one of them wasn’t associated with a flash. Flash would have absolutely destroyed the ambient light and also wouldn’t have been practical—backstage, you can’t be popping flash, grabbing the audience’s attention away from the show. Documentary work shot at the Saints and Sinners Fashion Show (Philadelphia, June 2011), presented by Couture Du Passe Part ll. Featuring work by Scripted Designs (Shay Sutton, MM#813639) and John Leon Designs (John Leon, MM#1985534). I’d like to thank Shay for graciously letting me attend to shoot documentary style. To Shay, John, MUAs, stylists, and all models: Thank you for your patience and performance. A quick shout also to Danish Leica shooter Thorsten Overgaard for providing a brief (but critical) piece of last-minute advice. 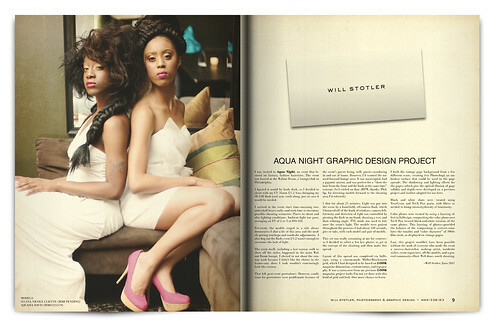 BTW, I’m Will Stotler, the photographer, Model Mayhem #1338163. See the full Documentary: Fashion Show set on Flickr, here. Model Kristina Paulk requested a shoot in late February 2011. I had some ideas about what we might be able to do, based on earlier shooting with Petrarcha in Philadelphia. Just a walkabout shoot, but with vintage clothing. Kristina liked the idea—she appreciates and has vintage fashions—so we scheduled it. We shot for about three hours in Philadelphia—the basic concept was to pick up shots as though we were shooting for a vintage magazine. I processed and delivered photo sets shortly after. 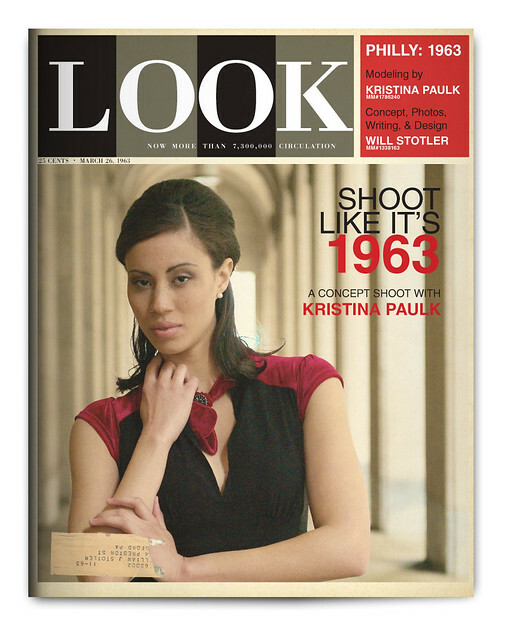 I wanted to do some magazine spread work and I had this copy of LOOK from 1963 that had grabbed my attention. . . . When Kristina met me in Philadelphia for the shoot she was wearing this dress. And I had her change out of it because it didn’t strike me as being particularly vintage—and, I wasn’t sure what to do with it photographically. I did promise her, though, that we’d shoot with it last so I’d have time to think about how to use it in a scene and pick up a vintage look with it. While Kristina was changing out of the dress I had time to look around and start thinking about it. I had a solution. The dress, evocative of the 1960s, was part of a future that never happened. J.G. Ballard gets at this concept in his work from the early 1960s: The atomic age is as much about the artifacts in concrete that are littering the landscape, the cradles of a future that has seemingly moved on without us. The structures being the only remaining objects, reminders, sentinels, warnings. I was also thinking about the ‘64/’65 Worlds Fair in New York City. The future was a marketing ploy—an imagined space where corporations had a vital (and continuing) role to play in shaping how we live. They were serving up the promise of a better life. As though the technology would solve the all-too-human problems of the present. The building material of choice was concrete. Plastic final forms made from liquid stone and left behind to decay. It was the future when they made it—and their work then serves as a reminder now that we’re in the future, but this vision of the future is from the past. And we’re still stuck with it. For good or ill. In any case, this is what I was thinking about when preparing to shoot Kristina in this dress: How to effectively capture the promise architects and workmen cast into their concrete structures—and the decay of that promise. I’d shot near the subway at City Hall in the past with Atul Narula—an accident, really. The time-period of the look was right for the early 60s. So was Kristina’s dress. So, why not? Almost half of the photoshoot’s photographs came from the shoot with this dress and in this environment. Kristina was on her game, I’d like to think I was on mine, and something was just clicking. I can say that going into this phase of the shoot I was unsure of whether or not I’d “gotten it” earlier in terms of the shots. (I had, but I was unsure.) It was largely uncertainty about using a 50mm focal length with tighter framing (I normally use a 35mm focal length in the city), trying to put into practice lessons I’d learned during the “Shooting Six” shoot from February (in terms of composition), and a bit of worry that the Elmar 5cm lens from 1953 wouldn’t give me results I could actually use—I’d never used it for this kind of shooting before. Kristina met the task. She matched her performance to the scale of her surroundings. Whether this was conscious or unconscious, I don’t know, but I’d like to credit her with working well in her surroundings to nail the look. Well done, Kristina. 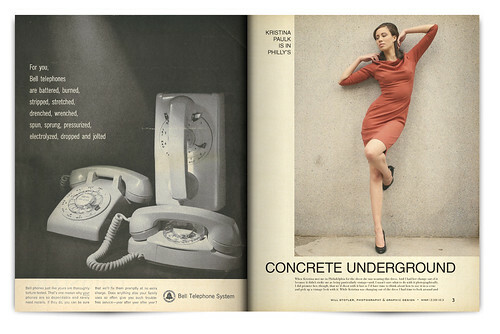 And the future is concrete. During the shoot in Philadelphia, I wanted to work closely with Kristina to use texture and color as backdrops for her vintage looks. As I said to Kristina—and as I was discovering myself—the more I shoot the less interesting most backdrops and backgrounds become. I’ve shot so many photographs now that I want interesting things, in terms of texture, color, how the light falls on the object, etc. For this dress, I wanted good, interesting light, and color to set it off. We shot with backdrops of stone, brick, the shiny red tile (above), and the degraded and decayed blue paint (left). I stressed backgrounds when working with Kristina and she had said at one point: “I’ll get a lot of photos with great backgrounds.” She did. In my opinion, the backdrop is the most underestimated object in most photography. The way a surface appears, the way it feels, the way the color will render—or how the texture will pop in a black and white treatment—are often overlooked. Or, just ignored. The subject is the whole photograph. The backgrounds are a critical part of the whole thing. Backgrounds, through framing and careful selection of color, accentuate the point of focus in the photo—and an interplay between the point of focus and the background are critical to establish mood, tone, time period, and a general aesthetic. Great backgrounds can be pulled out of just about anywhere—you work with what you have. The camera is as dumb as a brick, having no sense of time, place, or space. With something interesting to frame up your point of focus—in this case, Kristina and her vintage fashions—the negative space isn’t just there, it helps to make the final photograph work well. 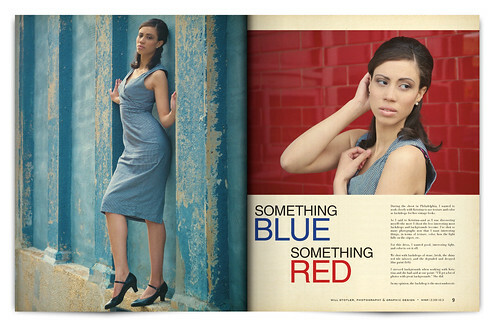 The “Something Blue, Something Red” photos, along with the cover shot, were taken with a 1953 Leitz Elmar f/3.5 5cm lens. I’d picked this lens up just to see what it could do and specifically so that I could have “poor” optical quality to degrade the image, as one would expect to see from an old lens. It did surprisingly well. My only criticism might be that it was “too nice” in how it rendered images. Bokeh is classic, which is excellent, but at f/3.5 it holds its own in terms of image quality. The “Concrete Underground” photos were taken with a more modern Summicron 35mm ASPH. I needed a wide for those and had already “risked” half of the shoot on the (to me) unproven Elmar. Black and white shots were treated using TrueGrain and Panatomic-X grain. Layout was completed via InDesign, using a custom-made Müller-Brockmann grid, which I designed to be based on LOOK magazine dimensions, content ratios, and typography. 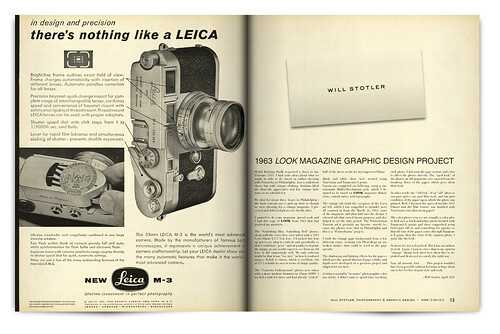 The vintage ads (with the exception of the Leica ad, left, which I was compelled to include), were all scanned in from the March 26, 1963, issue of the magazine and then laid into the design. I selected ads that served layout purposes and also helped to set the time period. The Pennsylvania Tourism ad is probably my favorite, strictly because the photos were shot in Philadelphia and this is a “Pennsylvania” project. I built the vintage page background from a few different scans, creating (via Photoshop) an unbroken surface that could be used in the page spreads. 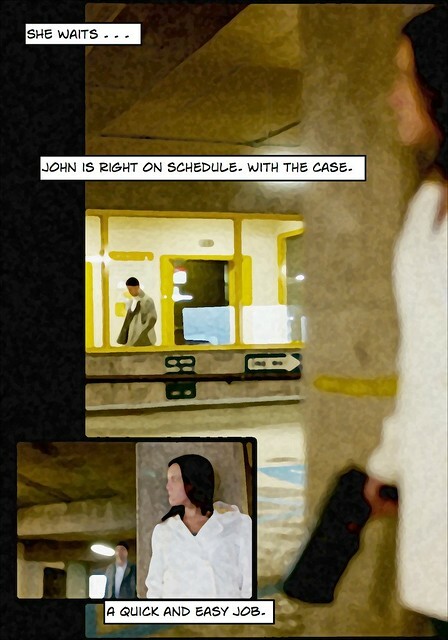 The shadowing and lighting effects for the pages—which give the optical illusion of page solidity and depth—were developed on a previous project and adapted for use here. Getting reasonably “accurate” photographic color was tricky. I didn’t want to spend time tweaking each photo. I did want the page texture and color to affect the photos directly. The “aged look” of the photos in old magazines are caused from the breaking down of the paper, which gives them their look. In other words, the “old look” of an “old” photo is one part optics, one part film stock, and one part condition of the paper upon which the photo was printed. Well, I’d gotten the optics down (the 1953 Elmar) and the film texture was handled with TrueGrain—but what about paper? The color photos you see are actually a color photo laid over a black-and-white photo (treated with Panatomic-X grain)and then composited using InDesign’s effects and controlling for opacity—so that the tint of the paper comes through Panatomic-X grain, then the color of the topmost photo. I quite like the look. In short, it’s not a clean look. But it has an authentic look. Again, I want to stress that in my opinion “vintage” things look their best when they’re degraded and destroyed in exactly the right way. Fun, all around. And. . . . This project wouldn’t have been possible without Kristina—a huge shout out to her for her elegant style and work. Sunday, February 27th, I had the pleasure of shooting with six models, a fashion designer, and a fellow photographer—to a killer shoot soundtrack—at Studio on Market in Wilmington, Delaware. It was my largest self-organized photoshoot to date—and, like my other shoots, this was a TFCD shoot. Everyone pulled together to make it a success. Thanks to everyone that contributed, as without your work, the shoot wouldn’t have been possible. This shoot started as a request from a workshop attendee, photographer Brian Bailey, who wanted to know significantly more about how to handle lighting. Brian is largely shooting sporting events but had an interest in more technical studio work. (His Website is GetShotByBrian.com.) His request couldn’t be accommodated in a workshop format—the hands-on component of working with lights to get it “just right” was more than that format allows. So I said: “What do you think about splitting the cost of studio space?” He agreed, and then I started to pull everything together. First, I secured space. Locking in the location first was critical—without a firm location, sending invitations to models would have been impossible. The team at the clean, new Studio On Market, in Wilmington, Delaware, were very helpful and had Sunday, February 27th available. (I’d recommend them.) 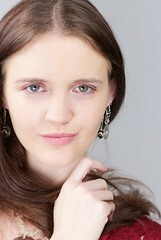 I booked with them after inspecting the space, which was perfect for the size and nature of the shoot. Next, I started securing models. I did this by posting a Casting Call on ModelMayhem and then following up with models local to the Wilmington area to see if they had interest. Follow-ups and questions were answered in a timely manner and models were booked. Then, one week before the shoot, it became apparent that I’d have between 5 and 8 models attending. After conversation, Wilmington fashion designer and artist T.Saph stepped up to support the event with her fashion line and designs. As the shoot had developed momentum, I also reached out to Josh Harnois. He is a classically trained musician, producer and DJ currently residing in Washington, D.C. (I shot Josh for his personal marketing material the year before.) I needed a soundtrack for the shoot and I wanted him to do it because he understood all aspects of what was needed: scoring music for film, modeling, appropriate attitude, photoshooting, and the attendee demographic. Of course, Josh nailed the work. So, I had a date, studio space, likely 6 models attending, a fashion designer with clothing, a soundtrack, and a fellow photographer to assist/train. After taking a deep breath, I started to plan. Going into a shoot this large would have been a disaster without planning and goals. Based on the studio space, training I’d need to do with Brian on the lighting, and individual model needs, I decided to focus on beauty/commercial shooting. I needed to settle on a range of looks, based on a “commonly accepted” beauty/fashion look. 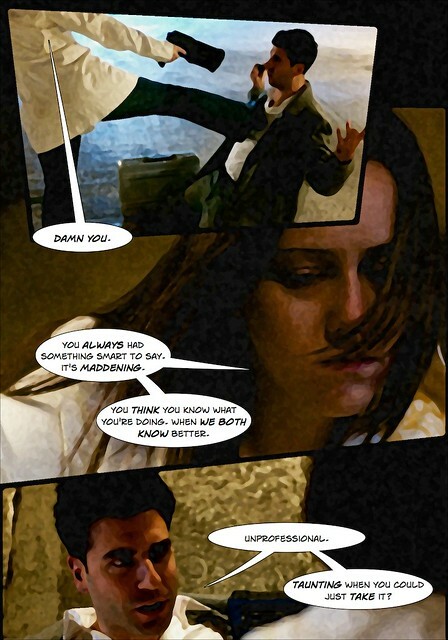 I consulted with a colleague of mine, graphic designer J.C. I posed the question: “In your opinion, what are the top three beauty/fashion magazines read by the 18 to 24 female demographic?” She identified Cosmopoliton, Glamour, and Elle, in that order. I purchased a copy of each magazine. 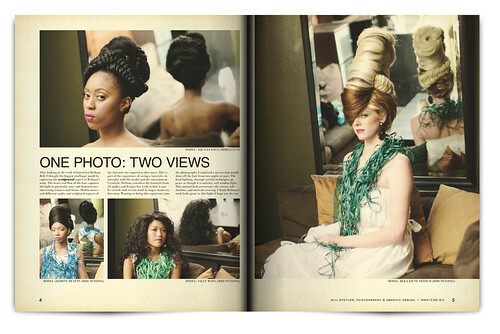 Then, I carefully removed any page from each magazine that was shot in-studio. I explicitly did not censor anything out based on my taste. If it was shot in-studio, I pulled the page. This was important so that a full range of looks could be gathered for analysis. A stack of loose pages was useless, so I created a modeling analysis book, where I pasted in every page (and double-page spread) that was relevant, leaving a facing page for notes. I analyzed each page, determining lighting setups (shadows, level of fill, modeling light, soft/hard, etc. ), framing, apparent focal length, f-stop (for DOF), text placement, and intended purpose of the advertisement or photo. For the modeling work, I got a feel for expression, hand placement, dynamic vs. static body positioning, and overall “feel” from each piece. I also identified where the Photoshop work was—to my disappointment, a significant amount of the Photoshop work in ads was readily apparent due to hasty execution. (If you’re going to do it, follow through, please. I shouldn’t see it.) IMO, Elle had the best straight-photography work. I circled back around with J.C. and had her take a look at the modeling analysis book. Based on watching her examine the book and verbally confirming conclusions, I got two takeaways: (A) Order of viewing a page’s content is: Clothing, Makeup/Hair, then Model. If close up, Makeup/Hair, then Model. If clothing/makeup/hair are not strong or not of interest, it’s all about the Model. (B) If the ad is about clothing, the clothing must “wear” the model. Or, if the ad is about makeup, the makeup must “wear” the model. The lighting, framing, pose, and facial expression accentuate acceptance of both A and B. Working with some past photography as a basis, I laid out mock magazine spreads, including text placement, to better understand the underlying composition and grid structure that was in use. Understanding more about that would help me frame and get what I needed day of shoot. I tested lighting setups and positioning to ensure I could get what I needed on set, prior to shooting. I determined that a two-umbrella setup, with a small softbox, would get me where I would need to go. Working through the mental geometry of getting models into the setups—based on planning to exploit the studio’s strengths—was the most difficult part. How would I manage eight people in the studio space and lighting setups during the day of shooting? To guarantee I could “get” it? I worked out three or four different workflows, building in failure points, and geared my goals appropriately. Provide a professional tone and good working environment. Each model had to take away at least 5 shots from at least two shooting sets that were technically on par with work in Cosmopolitan, Glamour, or Elle from a technical/lighting/framing perspective. Each model had to be given time to work and get comfortable so we could “get” it. Each model had to work with at least one other model in a shot—a “pair” shot. Each model had to have a a range of closeups, two-thirds, and full-body shots. Each model would model in at least two outfits. Each model would model in at least one outfit provided by T.Saph. No model could “sit” idly and un-utilized for any length of time. Models would work together—more-experienced models would be encouraged to mentor and work with less-experienced models, providing experience for both of them. Lighting would be continually adjusted to capture the framing, then mood, then accentuate the pose and clothing. 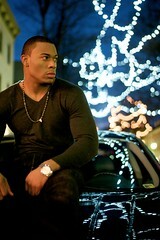 Brian Bailey (photographer) would be briefed on lighting, posing, and other shoot aspects throughout and continuously. T.Saph (fashion designer) would be given the opportunity to match her clothing line to the models as she saw fit—to pick up appropriate and useful looks for her needs. Keep the shoot to no more than four hours in length—one hour of test shots and two-and-a-half hours of work, once everyone was settled in. Not piss anybody off. More important, send everyone home satisfied with the experience and excellent photography. Strictly adhere to my 10 Guidelines for Shooting. As always, I’m interested in metrics as they pertain to my photos. 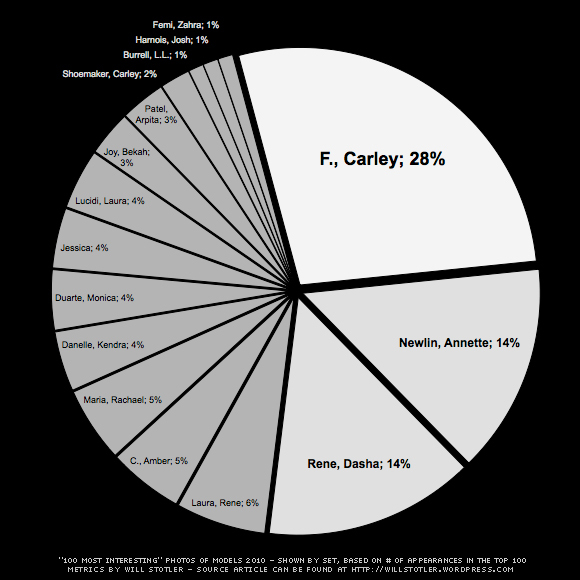 I always learn something when I view the data. And it always gives me something to think about, going forward. At the beginning of 2011, I created a set of the 100 “most interesting” images (according to Flickr, not me) that (a) contain models and (b) were shot in 2010. “Most interesting” is what Flickr determines to be “interesting”—it has nothing to do with personal opinion—based on data Flickr has related to the how and when the photo is viewed. At any rate, here’s some information about the Most Interesting 100. 56% of the Most Interesting 100 are from 3 sets. This is the “short tail.” There is a clear preference to these sets over all others shot in 2010. 44% of the Most Interesting 100 are from 12 sets. This is the “long tail.” Roughly, each of these sets, on average, has two magnitudes of order less “interestingness” as any of the top three sets. What is considered by Flickr to be “most interesting” disagrees in many cases with my own personal photographic taste. But, “most interesting” is certainly of interest to me—at the least I should be considering the factors that make something “most interesting.” While being aware that “most interesting” is only one “opinion”—Flickr’s opinion. It would be most interesting to see how an algorithm developed by fashion magazine editors would sort through my photo sets—or how an art photography professional would rank them. But, I have Flickr, which says perhaps more about the audience viewing the photos than the photos themselves, so you work with what you have. In any case, some new things to think about and test in 2011. As a parting shot, I’d like to thank each and every model with which I had the privilege of shooting in 2010—the photography I’m doing and brief statistical work like this would not be possible! See the Most Interesting 100 set of photos at Flickr. I was approached by Nick LaBella, a model I had shot earlier in the year, to do some “fall shooting.” Nick was looking for updates to his port along the lines of men’s fashion. Based on Nick’s look, I decided to contact Amber C., another model I had shot previously in the year, who had demonstrated action attitude. She agreed. 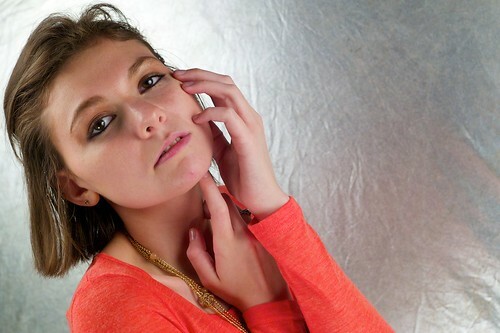 I had two models with which to work, both of which had strong looks and willingness to work a scene. Well, now what? I had been wanting to do an “action shoot” for some time and figured: “This is it.” So, I spoke with both models and they agreed to do action shooting in addition to “standard” fall fashion portfolio work—and to bring black “Matrix-like” clothing to the shoot. Two models. Ready to shoot action. Well, let’s not waste the opportunity through a lack of planning, eh? I decided to keep the action shooting small and doable. To generate ideas and get a good view of what the final product might be, I knew I’d need to do previsualization (“previz”) so I could think about story. Without story—at least in the flow of images—I’d have nothing. I grabbed my 5-volume set of Vertigo’s The Losers off of my shelf and started to flip through. Most of it wasn’t useful for my purposes, but there were individual shots I really liked. 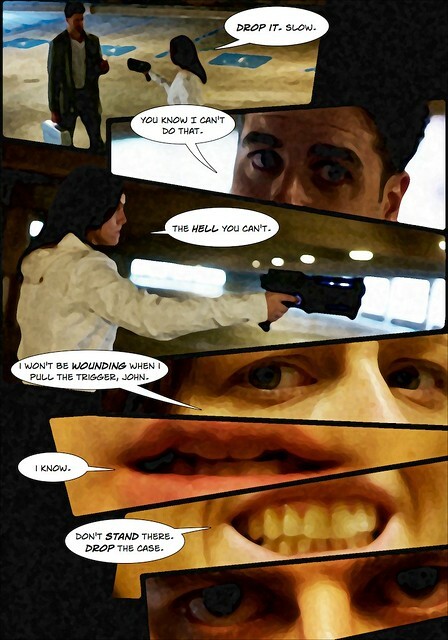 So, I stayed away from storyline and looked strictly at the layout of panels, the positioning of characters in the individual panels, and the use of angle/distance to convey mood and action. In the end, I scanned in about 12 pages from the whole set and swapped them around, using a page-level cut-up technique, and settled on a flow of six pages, the first and last being “signature” looks, and the four pages in-between conveying a rough flow of action. The key to this process was to find pages and panels that would convey a scene—completely divorced from the characters that appear on those pages and panels. 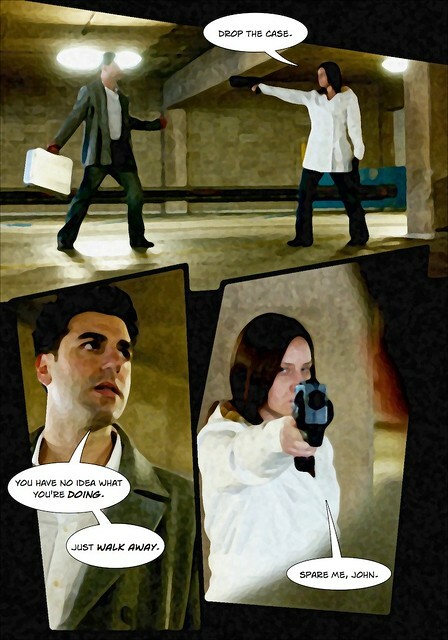 For story, I settled on a confrontation between a courier (with a Haliburton Zero briefcase)—played by Nick—and a contracted assassin who wanted to steal the briefcase—played by Amber. What I needed for Amber was a gun. I tossed around the idea of having her use a Glock. But it wasn’t enough. Based on Amber’s presence, I needed big, unreal, badass-looking guns. So . . . . I prepped up the guns and went off to the shoot. Results from the shoot can be seen below. NO I didn’t get something as stylish as what I wanted, but I did get lots of practice with linear narrative. And Amber and Nick had fun. So, win-win. See the full set on Flickr, here. Dunn, Jack F. and George L. Wakefield. Exposure Manual. Hertfordshire, UK: 1952. Malkiewicz, Kris. Film Lighting. New York: Simon & Schuster, 1992. Millerson, Gerald. 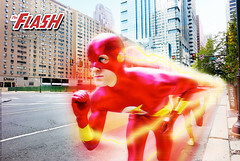 Lighting for Television and Film. Oxford, UK: Focal Press, 1995. Lowell, Ross. Matters of Light & Depth. New York: Lowell-Light Manufacturing, 2007. Silverman, Martin S., Jim Zuckerman, and Bob Shell. The Hand Exposure Meter Handbook. Elmsford, NY: Mamiya America Corporation, 1999. Vitray, Laura, John Mills Jr., and Roscoe Ellard. Pictorial Journalism. New York: McGraw-Hill, 1939. Newcombe, H.S. 35 MM Photo Technique. London, UK: Focal Press, 1946. Osterloh, Günter. Leica M: Advanced Photo School. New York: Lark Books, 2005. Krages, Bert. Legal Handbook for Photographers. Buffalo, NY: Amherst Media, 2007. Litwak, Mark. 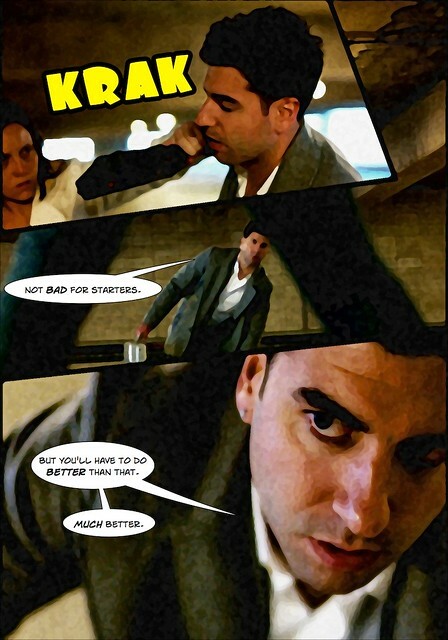 Dealmaking in the Film and Television Industry. Los Angeles: Silman-James Press, 2002. Adams, Ansel. The Negative. New York: Little, Brown, and Co., 2004. Traub, Charles H., Stephen Heller, and Adam B. Bell, eds. The Education of a Photographer. New York: Allworth Press, 2006. Several of these books are out-of-print now, but can be obtained by hunting around the Web.